Heading down I-35 from southern Oklahoma, by the time we hit the Texas line I was hungry. With no real food plans until dinner in Dallas, I was confronted with the age old question – “what do you want to eat?” I’d like to take this chance to proclaim the love for my beloved (who recently declared me her “favorite car buddy”), and to admit that she was incredibly indulgent of my food wants on this road trip and merely asked that I assure there was something she would eat on the menu, wherever we went. In case you aren’t aware, there’s a great app available from Texas Monthly (TM BBQ) which is a fairly encyclopedia index of barbecue joints in the Republic of Texas, those closely across its domestic borders and at random other locations in the U.S. It has a list of the “best” BBQ in Texas and a location-services-enabled finder feature. If they’ve reviewed a place for the magazine, it has snippets of reviews they’ve published. And it has rankings. I opened the app, listened to the sound of a brisket hitting a hot grill and searched for options. The best choice I could find, that would feed us soonest, was Big Daddy’s Ribs & BBQ, so I plugged the address into the GPS. 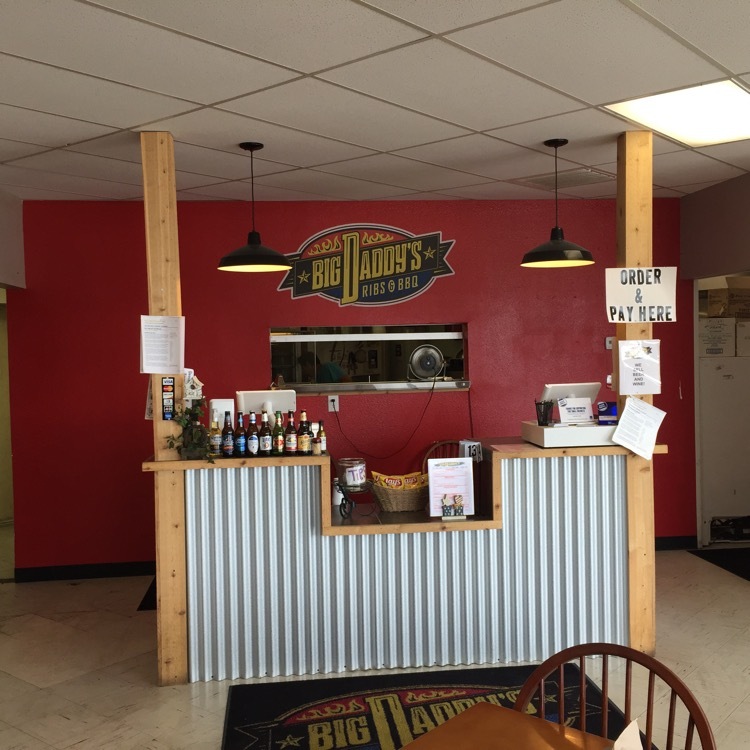 Across Lake Dallas, Big Daddy’s is located in the apparent-to-the-naked-eye planned town of Big Elm, Texas. We drove down the main boulevard, which has a lot of construction occurring and pulled up out front. 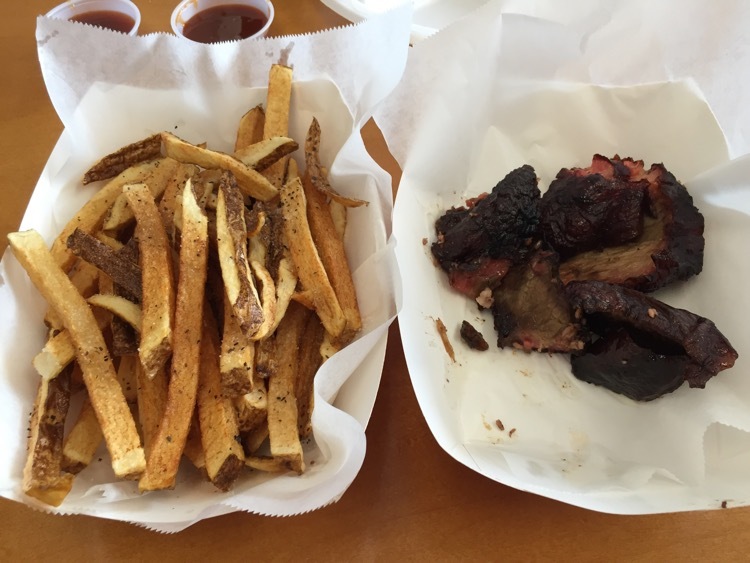 Based on the review from Texas Monthly, I intended on having burnt ends, if they were available. We discussed that we had a dinner reservation in less than four hours, so we’d just share a plate. I ordered the burnt ends with a side of fries and grabbed a sample of the three types of sauce they had at the condiment bar in the corner. If you aren’t familiar with “burnt ends”, as many of us raised in the south are not, there’s a great description (from Wikipedia) here. I first discovered them several years ago and they, along with good barbecued beef bologna, are the twin peaks of barbecue greatness for me. Blake Merrell, the owner, told us that on that Tuesday morning he had trimmed twenty-two briskets to get a little more than two pounds of burnt ends. I told him we had been referred from the Texas monthly review and he said the reviewer (who had eaten there anonymously) had been very kind to him in the review – except for dissing his green beans, which he staunchly defended. We didn’t have the beans. He also told us that he had made a burnt end sandwich one day earlier this week and his wife, and business partner, had told him that no matter how good it tasted, it was a twenty-dollar-plus sandwich and he shouldn’t do it again. There was one other fellow in the place when we were there – it was mid afternoon, but the place was setup like a fairly active neighborhood bar. I imagine when folks are at the lake on the weekends he does good business. Due to the emptiness we were able (the four of us) to carry on a pleasant conversation. Then the burnt ends arrived and the two if us stopped talking – because our mouths were full and our mommas raised us right. The burnt ends were very, very good, particularly with the hot sauce that he served. The fries were a perfect balance of crunchy exterior and creamy interior. Good choices on both counts. While we were talking, we learned that his other “hot item” (although it is prepared in a cold smoker) is smoked cheese. He’s found a way to smoke “loaves” of cheese without melting them and he brought us out a sample of his smoked white Vermont cheddar and smoked pepperjack. The cheddar was the better of the two and was excellent – smoky, but without losing the sharpness of the cheese. We’ve found this to be a difficult balance with smoked anything – keeping the inherent taste of the dish, while adding smokiness, without letting it overpower. I bet it makes a vicious cheeseburger. If you’re on Lake Dallas, or near Frisco, do yourself a favor and stop by.